It’s not unusual to hear a patient speak with love and admiration about the nurses that care for them throughout their stay in hospital. So too, the families of patients - grateful for the way in which their loved one has been looked after, often resulting in some level of personal attachment. But it’s not just patients that are impacted by the special bond which can sometimes form between nurses and those in their care. “Nurses are frequently involved in the direct provision of health care through a therapeutic relationship,” says Registered Nurse and Fellow of the Australian College of Nursing, Jason Mills. Across a variety of settings, nurses may bear witness to profound and intimate moments during a patient’s journey – at times demanding an emotional intelligence and compassionate presence, rather than a more procedural clinical intervention. “Given this, the therapeutic relationship between nurse and patient may well be experienced as a ‘closeness’,” says Mr Mills. “How close the relationship becomes depends on a number of factors, along with individual personalities and natures. “The length of therapeutic relationship may also be of influence. Nurses are required to appreciate the broader social context within which patient care is situated, and as a result, often get to know patients’ families and carers. In some practice areas like palliative care, the patient’s family is also an explicit focus of care. So while nurses may expect themselves to be able to easily manage the events that result from medical experiences, the reality can be a little more complex, particularly when it comes to patient deaths. “The impact of a patient’s death on nurses depends largely on the clinical context, as well as other interpersonal factors unique to the individual. “For example, nurses’ responses may be different if the death was unexpected in comparison to an anticipated death where both patient and family had been making end of life preparations. “Emotional responses to the death of a patient can vary greatly. While some may experience very strong or mixed-feelings, others might feel a ‘numbness’ - bereft of all feeling. “For some nurses, the death of a patient may be confronting or distressing, especially if they had no prior exposure to death and dying, or otherwise have not reflected on their own mortality. Nursing care does not end when the heart stops beating, or when the last breath has been taken. When a patient dies, nurses provide after-death care. This involves the respectful washing of the body, and its preparation for storage and collection prior to burial or cremation. Nurses also provide support to grieving families, who often like to participate in or carry out after-death care for the patient. But it’s important for nurses to recognise, acknowledge and talk about their own feelings of grief in a constructive way. “It is important for nurses to know that grief is a normal human response to loss. “Many nurses who work in areas like palliative and end-of-life care are highly cognisant of the need to acknowledge and express their emotional responses to grief and loss. 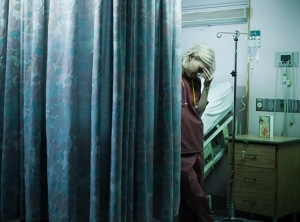 “However, some nurses may feel that it is somehow ‘unprofessional’ for them to grieve for a patient, and this may result in their feelings not being acknowledged or considered valid. “This is known as ‘disenfranchised grief’ – where grief is experienced in response to a loss that is not or cannot be openly acknowledged, publicly mourned, or socially supported. Most hospital and health services provide confidential employee assistance programs or other activities directly related to grief and loss. And while it’s vital that nurses feel comfortable approaching the resources available to them via their employers, a commitment to reflective practice and prioritising self-care are important strategies, says Dr Mills. “Nurses’ ongoing capacity to support and care for others is directly related to the degree in which they support and care for themselves. Self-care strategies might involve personal reflection, journaling, or some other form of expression such as art or poetry; or nurses may focus on the promotion of health and wellbeing in terms of healthy diet, physical exercise, social activity and getting adequate sleep. “While nurses practice as health professionals, they cannot be expected to be inhuman. The most important thing to remember? It’s okay to ask for help.